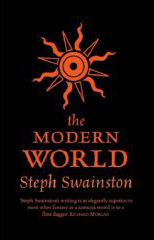 Steph Swainston’s third novel set in the Fourlands is “The Modern World” (retitled “Dangerous Offspring” for its US release). For the past few years the Insects have been kept at bay, the Castle’s forces keeping them from expanding their Paperlands. However, the armies of the Fourlands have been content with just stopping the Insects invading, they haven’t attempted to win back any of their former territory, at least until Frost – the Castle’s immortal architect – comes up with a plan to reclaim some of the Paperlands. The Insects can’t swim or so she sets about the construction of a giant dam across a river that forms the border of the Paperlands. Once the lake behind the dam is filled the insects there will be drowned, and once the waters subside the Fourlands’ armies can march in and reclaim the territory. As the dam nears completion military forces from across the Fourlands as well as all the Castle’s immortals gather to prepare to strike. The plan is a good one based on their knowledge of the Insects but some unforeseen events mean that the Fourlands end up in more danger than ever and the entire resources of the continent are forced to gather to withstand a potentially devastating Insect assault. The danger is so great that the Emperor himself is forced to ride out from the Castle for the first time in millennia to leads the Fourlands’ armies. Meanwhile, the novel’s narrator Comet has his own problems as he is tasked by his immortal friend Lightning to search for Lightning’s teenaged daughter Cyan, who has run away from her minders on a visit to Hacilith, the Fourlands’ biggest and most dangerous city. A spoiled young noblewoman with little experience of the real world but a big sense of entitlement and thirst for new experiences and adventure, Cyan finds herself quickly out of her depth and Comet is forced to venture into Hacilith’s underworld (a place he is very familiar with) to retrieve her. As the time for the strike against the Insects approaches Comet and Cyan then join up with the Fourlands army and Cyan increasingly clashes with her father, forcing him to confront how out-of-touch with mortals he has become during his thousands-plus years of life. Although the main part of the novel is taken up by the two plots described above, there are a number of interesting subplots, including a venture by Comet and Cyan to the world of Epsilon where they are pursued between worlds by a demonic hunt in the novel’s most thrilling sequence. There are also three particularly good flashbacks, the novel opening with Comet reliving the memories of a past disaster in the Insect war, as well as two interludes unusually narrated by someone other than Comet – Lightning reminiscing about his tragic first marriage and the Castle’s Doctor Rayne telling how she came to be immortal. After the good but slightly disappointing second book this is a definite return to form. Swainston returns to the Insect War that is at the heart of the series and the battle scenes are the best in the trilogy, while the intrigue between the immortals is equally entertaining and has a direct impact on the battles. Refreshingly, although it makes a couple of appearances in the story, Epsilon and the worlds of the Shift don’t have quite the same impact on the main plot as in the previous books, instead the plot being largely decided in the Fourlands. The characterisation is again very good, the new major character Cyan is convincing although (since her character is basically a spoiled teenager) inevitably irritating. The chapters devoted to Lightning, Rayne and Frost allow a bit more character development for immortals other than Comet and even the enigmatic Emperor has a bit more of his character revealed, although in his case each answer only brings up more questions. Thought there is less time spent on world-building than in the first two books there is still some extra depth added to the world, although some minor aspects do seem a bit unconvincing - while a certain amount of anachronism is an integral part of the Fourlands, it does seem a bit out-of-place to have Comet complaining about his old haunts being replaced by trendy wine bars. The quality of the writing is again high, whether it is describing the horrors of war, the petty complaints of a spoiled teenage or the wonder of Comet’s flight over the land, and seems a bit more polished and memorable than the prose in “No Present Like Time”, with a number of good quotes and passages. Lightning and Rayne’s flashbacks also have their own distinct voices, which make a nice change from Comet’s admittedly entertaining narration. In summary, this is another excellent Fantasy novel which adds more depth to the Fourlands and its characters, while at the same time delivering a compelling plot with some excellent scenes.